The pattern of voting by region in the recent Brexit referendum reflects economic and demographic factors. Moreover, attitudes towards having immigrants as neighbours, fear of the influence of immigrants on society, fear of the UK losing national identity, its paying more to the EU while losing power in the world, and fear that native workers will lose jobs also reflect these same economic factors. A region with low GDP per capita, a large proportion of workers with low education, and a large proportion of people over the age of 65 is more sceptical of the EU and immigration than under opposite conditions. There are two exceptions – Scotland and Northern Ireland, where people seem to have a positive attitude towards the EU and immigrants – that are not explained by these economic factors. A majority of 51.9% of voters decided in a referendum held on 23 June that the UK should leave the EU. While the UK has been reluctant to take part in many EU initiatives in recent decades, the outcome of the referendum was a surprise to most observers, as well as to currency markets. The reasons for the leave vote may tell us something about the roots of opposition to the EU in other European countries, as well as opposition to free trade and globalisation. Here we focus on whether the leave vote can be explained by economic factors, or by values and attitudes towards the EU and immigration. We ask whether such values are independent of economic factors, or a reflection of them. We are not the first to explore the role of economic factors in referenda on EU-related matters. Jonung (2004) studied voting patterns in the 2003 Swedish referendum on whether to adopt the euro or keep the Swedish krona. Using the results of exit polls, he found that the pattern of voting was consistent with the self-interest of voters based on the theory of optimum currency areas. Thus the vote to adopt the euro was strongest among voters in the tradable sector, in high-growth regions, and among high-income workers and the well educated. In contrast, the vote to keep the krona was strongest among workers in the public sector, workers with low income, and the unemployed and less educated. In a recent paper, we study the pattern of voting in the UK referendum for 36 NUTS2 regions (Arnorsson and Zoega 2016). Using the method of canonical correlations (developed by Hotelling 1936), we estimate the relationship between economic and demographic variables on the one hand, and attitudes towards the EU, immigrants, and the pattern of voting on the other hand.1 We estimate a latent variable E by assigning coefficients to the rate of unemployment for each region, GDP per capita, the share of the working-age population with low education, the rate of immigration, and the share of the population over 65 in each region. 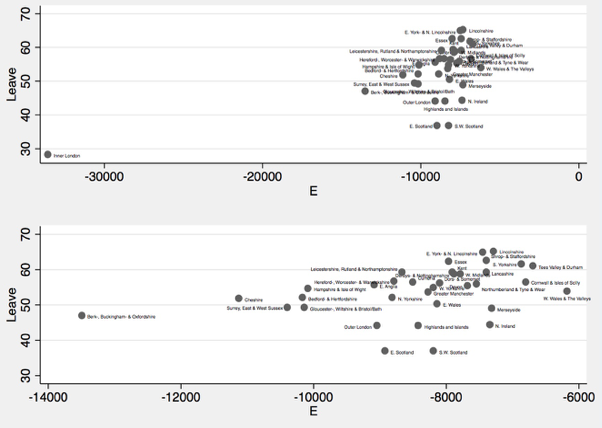 Similarly, we estimate a latent variable V by assigning coefficients to several measurable variables that measure attitudes towards the EU,2 attitudes towards immigrants,3 and the share of the leave vote in the referendum.4 The coefficients are chosen so as to maximise the correlation between E and V (see Figure 1 below). The results show that the correlation between the economic and demographic variables is 0.79, so that the former explains the latter to a great extent. A combination of the economic variables contributes to scepticism of the EU, dislike of immigrants, and results in voting for Brexit. The pattern of voting in the referendum reflects differences in the share of the over-65 group and the less educated across regions (with these two groups more likely to vote for Brexit). A high rate of immigration and low levels of GDP per capita also correlated with greater propensities to vote to leave. These variables explain not only the voting patterns but also the attitude towards immigrants as neighbours, the perceived dangers posed by immigrants to society, and feelings of apprehension towards the EU. Figure 2 shows the relationship between the latent economic variable E and the leave vote by region. Note that the top figure includes Inner London, while the bottom one does not. There is an upward-sloping relationship in the figures. Clearly, Inner London is a special case, in particular because of a very high level of GDP per capita. Excluding this region from the bottom figure also reveals an upward-sloping relationship, but note that the Scottish regions and Northern Ireland blur the relationship, as they have a lower leave vote than the value E would predict. If it were not for Scotland, the correlation between the latent variable E and the leave vote would be even stronger. We then estimated an equation that explains the leave vote by region as a function of the economic variables (see Arnorsson and Zoega 2016 for method). The estimates suggest that an increase in GDP per capita of €5,000 – such as between the West Midlands on the one hand, and Surrey and Sussex on the other – will lower the share of the leave vote by 0.55%. An increase of 5% in the share of the population over the age of 65 – such as between West Yorkshire versus Herefordshire, Worcestershire, and Warwickshire – will increase the leave vote by 3.3%. A 5% increase in the share of the population with low education – such as between Inner London and Dorset – will increase the leave vote by 4.8%. The coefficient of the migration variable is less significant (insignificant at the 10% level), but a 2% increase in the rate of immigration would raise the leave vote by 1.55%. The vote to leave was lowest in Inner London (28.09%) and highest in Lincolnshire (65.16%), with a difference of 37.07%. This can be explained by several factors: lower GDP per capita in Lincolnshire that leads us to predict that the leave vote would be 10.2% higher there, a larger share of the population with less education that gives a 10.5% higher leave vote, and a larger share of the population over age 65, which gives a 9.1% higher leave vote. In contrast, differences in the level of migration do not play a major role. The residual is 6.3%, which is the unexplained leave vote in Lincolnshire. Should the unskilled fear immigration? We have found that old people and those with low education and low income tend to dislike immigration and fear the influence of the EU, and therefore voted for Brexit. A likely reason is that they feel vulnerable to immigration from other European countries. However, the empirical evidence on the adverse effect of immigration on the labour market is weak, although there is some evidence that the lowest-skilled workers in the UK may be adversely affected by immigration (Nickell and Saleheen 2015 find that a 10% rise in the proportion of immigrants working in the semi-/unskilled service sector leads to a 1.8% reduction in pay). Given the limited effect on wages, an exaggerated fear of immigration in public debate may have influenced voters to want to leave the EU. Thus, voters perceive the numbers and effects of immigrants as being much greater than they actually are. In a Mori poll published on 9 June 2016, two weeks before the referendum, respondents thought on average that EU citizens made up 15% of the total UK population (around 10.5 million people), whereas the actual figure is 5% (3.5 million people). We have found that, as in Sweden’s referendum on euro adoption, economic factors can explain the regional variation in the Brexit vote, as well as the variation in attitudes towards immigration and EU enlargement. The regions that have benefitted most from immigration and trade voted most strongly in favour of remaining, while the regions where people feel most threatened voted to leave. The relationship between economic factors and values may also end up causing other EU countries to leave, as well as propelling anti-immigration, anti-globalisation political parties into power. It is therefore of great importance that economic policy aims at making the gains from trade and immigration as widespread as possible. Arnorsson, A and G Zoega (2016), “On the Causes of Brexit”, Working Papers in Economics and Finance, 1605, Birkbeck College. Alesina, A F, E Spolaore, and R Wacziaarg (2000), “Economic Integration and Political Disintegration”, American Economic Review, 9 (5), 1276-1296. Honahan, P and J FitzGerald (2016), “Ireland and Brexit,” VoxEU.org, 12 August. Hotelling, H (1936), “Relations between Two Sets of Variates”, Biometrika, 321-377. Jonung, L (2004), “To be or not to be in the euro? Benefits and Costs of Monetary Unification as Perceived by Voters in the Swedish euro Referendum 2003”, Cato Journal, 24 (1-2), 123-149. Nickell, S and J Saleheen (2015), “The Impact of Immigration On Occupational Wages: Evidence from Britain”, Staff Working Paper No. 574, Bank of England. Wooton, I (2016), “Brexit – a view from north of the border”, VoxEU.org, 14 August. Unemployment is the rate of unemployment in 2015 for workers aged 15 and over. GDP per capita is measured at current market prices in thousands of euros. The share with low education is the percentage of inhabitants between 25 and 64 years of age with less than primary and lower secondary education in 2015. The share of the elderly is measured as the share of the total population 65 years old or older. Immigration is measured as net migration as a share of the population in each district. Factors include fears of the loss of social security, loss of national identity, paying more to the EU, loss of power in the world for the UK, and loss of jobs for natives. Factors include not wanting to live next to people of a different race, Muslims, immigrants, and homosexuals, and fearing that immigrants take jobs away from natives, undermine cultural life, increase crime, impose a strain on the welfare system, and threaten society. The values variables are taken from the European Values Study. Alesina et al. (2000) show how openness and economic integration allow small cultural or ethnic groups to form small, homogeneous political jurisdictions while enjoying the economic benefits of access to a large market.